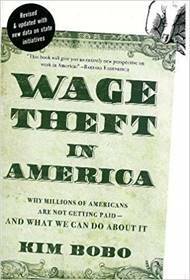 Wage theft is the illegal underpayment or nonpayment of a worker’s wages. There are many ways that unethical employers engage in wage theft, such as when they do not pay minimum wage, or don’t pay the overtime for premium hours worked. Though common in many low-wage sectors, wage theft also occurs with middle and lower-wage earners. Come hear Kim Bobo, one of America’s foremost experts on the subject, and learn what we can do about a problem that afflicts many Americans.